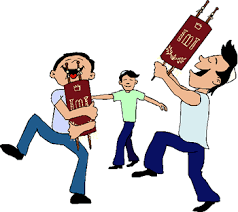 Back when I was teaching children’s church I read about the Jewish festival of Simchat Torah. It means “rejoicing with the Torah” and it marks the end of the annual cycle of Scriptural readings. On that evening the scrolls are taken from the ark and the congregation literally gets out of their seats, filling the room with singing and dancing for hours. I love that. My joy in the Scriptures has increased exponentially as my understanding has grown–and as I’ve had the privilege of teaching others. Studying my Bible could easily end in a lively jig around my living room. However, the celebration of Simchat Torah took place in the congregation–and that’s an important difference compared to dancing alone. Most of us are aware of the privilege of holding our own copy of the Bible in our hands and reading it for ourselves. We also know that this important aspect of Christianity—have and reading Bibles of our own—hasn’t always been the case. We have some vague idea that during the Middle Ages the Church took the Bible from the hands of the people and insisted that their interpretation (that is, the leaders in the church) alone was the correct one. This meant the church leadership believed in two final authorities–the Scriptures themselves and the Church’s interpretation of them. Both were considered infallible. The only way to avoid error was to keep the middleman (you and me) out of the loop of interpreting. That’s good news for all of us who prize the personal study of Scripture. But does it mean that I can or should understand my Bible all on my own? Not exactly. The early church did affirm that the Bible alone was God-breathed, but they also believed the Bible should be interpreted with great care, not by one person but by many godly leaders working together to come to agreement on the core doctrines. The Apostles, councils, creeds, and church fathers hammered out one doctrine after another, seek precision and depth of understanding. These became passed down as the “Rule of Faith,” an authoritative, though not infallible interpretation of biblical Christianity. That’s what Martin Luther put into the hands of the peasants, the Bible as it had been historically interpreted. Coming up with my personal, private interpretation of Scripture can lead to heresy. In fact, most heresies arose not apart from Scripture, but by reinterpreting Scripture independently from the consensus of historic orthodoxy. Despite these temptations and dangers in studying the Scriptures solo, there is still reason for much joy and growth in personal study, which is what this blog seeks to encourage. If you have ever consulted a commentary or Bible reference tool while trying to understand a passage, you are already appealing to the “received tradition.” Studying the text and then consulting the commentaries is a great way to place God’s word first and then learn from others. It’s also a wonderful tool in confirming a correct understanding of the Word! Your pastor can. In fact he’s called to do just that: “do your best to present yourself to God as one approved, a worker who has no need to be ashamed, rightly handling the word of truth.” 2 Timothy 2:15. That’s a solemn and important charge for every pastor. While it is true that not every pastor fulfills this call, we should place a high value on the ordinary ministry of a faithful pastor who takes this charge seriously and diligently seek the leadership of such men. One pastor friend from the Pacific Northwest commented about this very topic on Facebook recently. Well said. Our pastor must study. But he must also recognize that he stands on the shoulders of so many others. And so do we. If you’d like to explore this topic further, my husband, Mark, has published posts here, here, and here. blessed by God’s Word daily searching and meditating too!